I am emailing you at the suggestion of Jeebesh Rayamajhi in regard to my visit to Nepal next month. I'm spending a month in Nepal as part of Stray Dog Productions - an artist collective involved in a British Arts Council project that connects 2 seemingly disparate locations, Lyme Regis, Dorset UK and the Annapurna region, Nepal. The literal connection is a 250 million year old limestone layer (Blue Lias) that runs from Lyme to Nepal, and holds the ammonites that are a feature of the Jurassic/heritage coast in this part of England. This seam also acts as a metaphor for a more universal, but perhaps unseen, interconnectedness. I'm a teacher, writer and director and my specific area of interest is in performance and storytelling. From Carol Davis' analysis of your play 'Dreams of Peach Blossom', I have a sense that we share a common interest in theatre for social change and in particular. a desire to open a space for a "...sky of my own' for young women. Perhaps you would have some time free to meet with me for a conversation in a coffee shop in Thamel at some point? Nice to read your mail. Let us meet and talk in Thamel as you suggest. Call me when you reach Kathmandu. It seems only yesterday that we were interviewing you in the peaceful garden of Pilgrim bookstore - and now it no longer exists. What a great loss and how very difficult for Bimal and his family. On our return to England we have begun sifting through the vast reams of material and interviews we collected. I have an idea for an 'Erosion' project in which a Nepali text is imbedded into the Dorset landscape. The text I have in mind is the poet's opening speech from your play 'Dreams of Peach Blossoms' beginning with "Images scamper...."
through to the end line "Time is silhouette"
The idea is this: in Lyme Regis, Dorset, there is a large 'table' of rock on Monmouth beach covered in fossils. This fossil table is only visible at low tide. We would take the Blue Lias/limestone (which runs intermittently from Lyme Regis to Annapurna region of Nepal) and mix it to a paint consistency. With this Blue Lias 'paint' I will write the poet's speech directly onto the fossil table and as the tides change and the sea laps, the text will slowly be erased and washed away. In this way I can write your text into the landscape in a mutable form. The process of this text erosion will be filmed and projected onto one of the walls of the Jam Factory during the festival. Would this be acceptable to you? How nice to hear from you again! Yes the Pilgrims! How sad, and how nice to remember our conversation in that space! I became very happy to know you are planning to use my play for that. Please do use as you are planning. Wish could see what will be a very nice performance! If you keep some visuals, clips etc would love to see. of all times going. Sea stones carved by waves and stones in dreams of peach blossoms carved by artists-they worked with waves too- make it all happen! thankyou for your kind words of encouragement regarding the 'Erosion' project. Creative ideas don't always translate into actuality. I managed to imbed your text - a mix, as you say, of ancient and new - into the Dorset landscape and onto the 250 million year old carapace of ammonite and rock. However, as is often the case, I got something other than planned, something more. I published an essay in the national English daily today about your 'Erosion project' and what it means to me. Wonderful people here have liked my essay so I am glad. Sorry, used the personal letter content for the essay. delighted to hear about the essay - and no, I don't mind at all about you using email quotes. Have just returned from travelling and will read your essay at length tomorrow. I wake up with the news of turbulence each morning. Mayhem in the Middle East is looming large. Scenes of babies and children, adults and the elderly writhing under chemical effects horrify me and I feel useless. I also feel anger rising deep down like a cyclone. All I can do at such moments is write some expressionist content, a theatre scene or two and talk about the threats human beings themselves bring on the existence of other fellow beings. It is a known fact that the number of people killed by states, human organisations and groups is three times more than those killed by natural calamities. The promise of mayhem looms large in Nepal too, with some big parties threatening active rejection of polls and the parties in control closing doors to further dialogue. Other calamities come with our reckless destruction of nature. Just the other day, I watched the last green tree in the neighbourhood go down unceremoniously. Perhaps very soon, Kathmandu will be a capital without a single standing tree. Sometimes I suddenly feel short of breath while walking or driving. Last week, when I felt that, I went to see a senior physician who said that this happens because we cannot send enough oxygen to the brain when we breathe. Such asphyxiating effects will increase day by day. It occurs to me suddenly, a satori almost, we are globally facing similar challenges but the only way to make life easier is to make individual efforts to save our own world. We are failing on both scores. One link reinvigorates creative consciousness. I have just received an email from a theatre director named Karla Ptacek of Britain who I had met here a few months ago with 3 other women from Stray Dog Productions. They were out collecting material in the Himalayan region. They showed me what appeared to be nondescript black stones, rough avatars of what we call saligram. Karla wanted to stage an idea, 'Erosion', to show that the sea currents once touched our shores. The carapaces speak about that. All that is beyond my imagination. But it is a big challenge, a sea drama, perhaps I had never known before. Karla surprised me by saying she wanted to use for the sea drama, a speech from my short poetic play entitled 'Dreams of Peach Blossom' written over a decade ago and performed by the theatre groups Gurukul and Sangya many times. I did not understand how that could be possible. A landlocked man's nostalgia for a big water mass is a dream imbued with love and pain. In my play, set in the interiority of the exquisite old Bhaktapur Durbar, I have written about the sound of water where there is no water; rustle of leaves in a garden where there are no trees, and cries of unwilling young women who get married off in the inner courtyards that are silent and reified now for tourism. Karla writes, "In the end I managed to imbed your text-a mix, as you say, of ancient and new-into the Dorset landscape and onto the 250 million year old carapace of ammonite and rock." Performing this tiny act on Monmouth beach links human drama on a different plane. We are all linked by creativity and disaster. What Karla writes has deeply shaken me and my reified literary epistemology. Most of all, the poststructuralist argument about the transience and the anitya character of texts is experimented under sea waves. collected from the beach, making it 'endlessly slow to erase underwater'. Charcoal was a better option with texts 'disappearing in a whisper'. In this manner, they wrote enough text and the sea was advancing, giving just enough time to record it. At last, she says, "things started to happen: the sea did its duty, swirling around your words, coughing up stones, seaweed and shells, obliterating letters in eddies of froth and bubbles." of women's suffering. But now, this very diversity links us to the universe. A current rising in the north, a huge ice that melts and gurgles down the northern sea, an avalanche that crashes down the Everest region, are all linked now. Children suffocating and dying under dictators' chemical bombs, soldiers killing civilians and sovereigns justifying their actions in the name of peace and security make up a text that is shared by everybody in the world today. far and near, all bring humanity closer and make them partners in the fight for the restoration of normalcy, life and health. Karla's 'erosion project' not only erodes words of a poetic drama, but to my mind, brings us together in our efforts to save what we have achieved, if we work together. I imagine Buddha too must have seen texts dismantling in a state of Nirvana under eddies of consciousness, knowing they would be caught again and put together eventually. To see texts picked by eddies and the northern and Everest ice caps melt, therefore, is not an apocalyptic vision but the realisation of a moment in common existence in this earth that promises to generate new energy for life. Your fine essay has sewn together this little project into a much larger canopy of ideas, connecting the personal and the universal, both near and far. You understand what I had in mind and relate this both to the wider world and to the last green tree in a neighbourhood in Kathmandu. In this way, you have enabled the 'Erosion' project to reach fruition and for that I am deeply thankful. 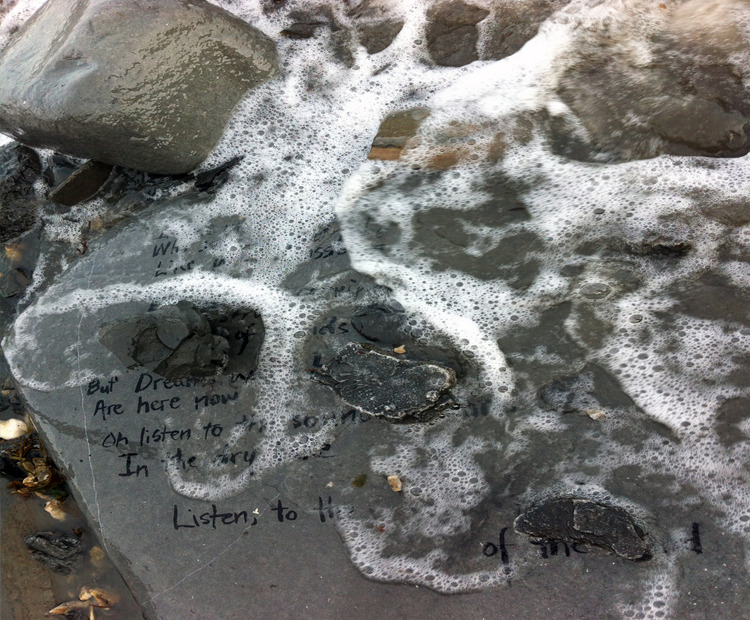 culminate in a film showing the sea's erasure of your text on Monmouth fossil table. Despite best efforts, we couldn't get a complete film of the erasure and after 2 days of experimentation and with the pressure of lots of other work to be completed for the festival - photography, sound recordings, sculptures, film, music, performance etc - I called a halt to the project. What you have done with your essay Abhi, is to excavate, elaborate and extend the ideas around this imbedded Nepali text and its erasure in an English seascape. This now becomes your version, and it loops back to Nepal through the readership of your essay, renewing and enlarging the original before it is returned to England. In this cycle and re-cycling, words and images morph and transcend boundaries. I still see my non-existent film in my mind's eye, as I think, do you. It is projected onto one of the tall walls of the Jam factory - our creative home in Dorset. The film is huge, extending across one entire wall. It loops. It is silent. I can write about this film, where there is no film. It's captured here, in these words we exchange together, and, as you say, through this process, energy is released - and what energy!